“Forget the 401(k). Let’s Invent a New Retirement Plan.,” by Jason Zweig, The Wall Street Journal – Wealth Management, February 10, 2019. “Inflation-Linked Bonds Give Retirees Diversification and Hedge Against Inflation”, by Robert Powell, USA Today, March 22, 2017. “Harvard’s Humbling: Richest Endowment May Look More Like Yale’s”, by Michael McDonald, Bloomberg, September 21, 2016. “The Aging Bull Market Is Raging Anew”, by Kopin Tan, Barron’s Streetwise, July 16, 2016. “An Alternative View on Modern Portfolio Theory”, by Ann Logue, Hedge Fund Intelligence, July 6, 2016. “Why Ultra-Low Interest Rates Can Crimp Economic Growth”, by Gene Balas, United Capital, May 3, 2016. “How ‘Super Savers’ Take Retirement to the Next Level”, by Chris Taylor, Reuters, December 8, 2015. “Retirement Planning: Expert Advice for Long-Term Investing”, by Avi Salzman, Barron’s, November 7, 2015. “The Ultimate Income Strategy”, by Kerry Pechter, Retirement Income Journal, January 22, 2015. “The Best (and Worst) Investments They Ever Made”, The Wall Street Journal – Weekend Investor, December 26, 2014. “The Rule of 22 (or 21.47)”, Northeast Planning Corporation, March 14, 2014. “The Economic Implications of an Older World” (interview with Michael Falk and Laurence Siegel), by Paul D. Kaplan, Morningstar Magazine, February-March 2014. “Retiring on Your Own Terms”, by Jason Zweig, The Wall Street Journal – Money Beat, January 31, 2014. 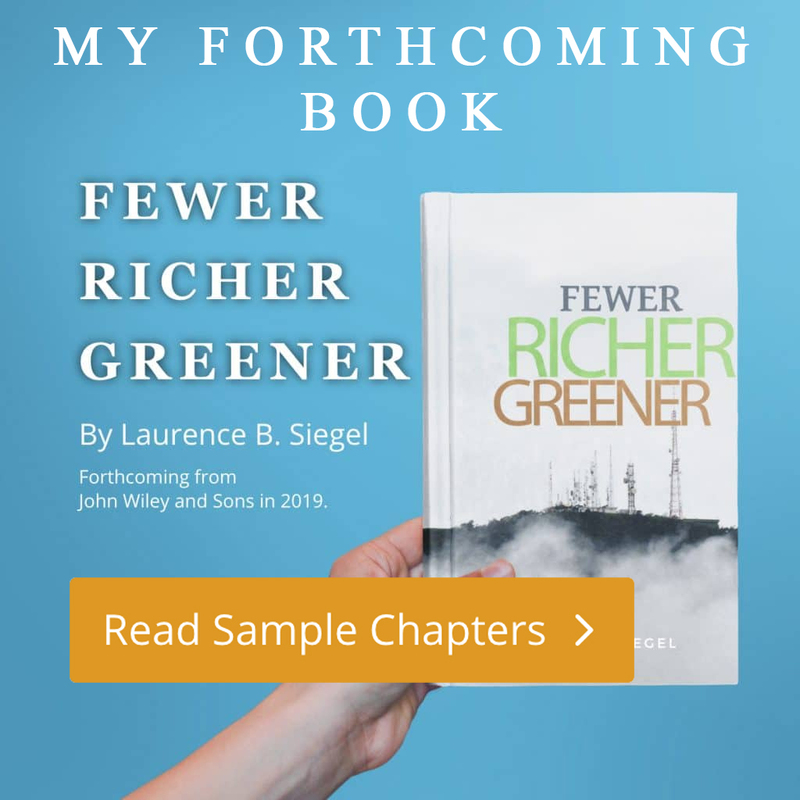 “Fewer, Richer, Greener: Larry Siegel’s Reasoned Rebuttal to the Economic Doomsayers,” by Michael Ryval, Morningstar Investor Insight, April 16, 2013. Why “Fewer, Richer Greener”: Investment thinker Larry Siegel dares to be contrarily optimistic, interview by Kathryn M. Welling. Welling on Wall Street, January 11, 2013 (vol. 2, issue 1). “Can you Sum up your Investing Philosophy in 10 Words?” by Jason Zweig, January 27, 2012. “Siegel’s myths,” in “Ordem e Progresso,” by Christopher Holt (unattributed). All About Alpha (online), May 2, 2010. “Don’t pay Alpha Fees for Beta Performance,” by Robert Huebscher. Advisor Perspectives (Lexington, MA), July 8, 2008. “The Alpha Beta Chowder: Understanding Portfolio Risk and Return.” Advisor Perspectives (Lexington, MA), Oct 2, 2007 (volume 1, number 21). “Perspectives on Risk: An Interview with John O’Brien and Larry Siegel,” The Monitor, Investment Management Consultants Association, Denver, March/April 2004 (volume 19, no. 2), (go to page 3). “Against the Grain” (interview with James Orford), Plan Sponsor, October 2004, pp. 122-123. “Value will Out, But Not by a Lot from Here,” interview with Kathryn M. Welling, Welling@Weeden, , volume 4, issue 14 (June 28, 2002), pp. 1-6. Excerpted as “Value will out,” Apogee Research (formerly Grant’s Investor), July 5, 2002. Excerpted as “Value vanquishes the bear,” Traders Magazine, August 2002. “An Interview with Laurence B. Siegel,” by Mike McGrath. The Monitor, Investment Management Consultants Association, Denver, September-October 2001, (go to page 2). “What Fund Investors Really Need to Know,” by Jason Zweig. Money, June 2002, pp. 110-124. “How the Big Brains Invest at TIAA.CREF,” by Jason Zweig. Money, January 1998. “The Hidden Cost of Zero Interest Rate Policies”, with Thomas S Coleman, December 10, 2015.